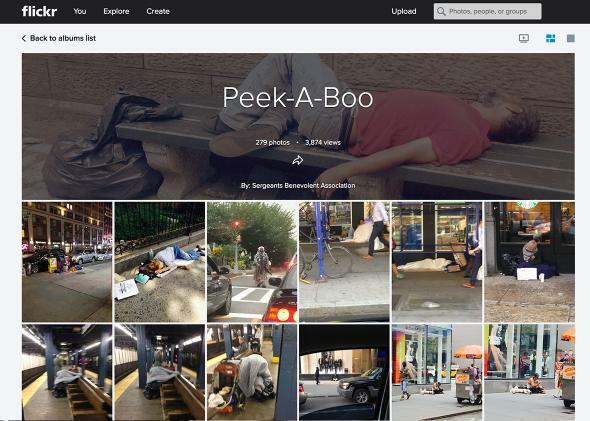 NYPD homeless photos, mockery: Union encourages pics as political move. The Flickr page in question. Homicides are in fact up 10 percent so far in 2015 versus 2014’s numbers, officials have said, though the city is also on pace for its lowest number of overall felony crimes in two decades. There doesn’t appear to be statistical evidence that homelessness has increased drastically, the New York Times reports, but opinion polls indicate that a majority of residents believe the mayor—who recently announced “a $22 million mental health initiative that his administration says will aid the homeless”—is handling the issue poorly. The SBA has compiled the photos on a Flickr page titled “Peek-A-Boo”(!). One photo is ironically labeled “bed and breakfast,” several refer to homeless people as “bums,” and one is labeled “disgusting.” Here’s one taken by someone who apparently leaned way over to get right in an unconscious man’s face.